Today I will show you how to draw the huge dog, Duke, from The Secret Life of Pets, sitting on Max, one of the other dogs in the movie. This is a simple-to-follow step by step drawing tutorial that is filled with basic geometric shapes that you can follow along with. Have fun. (Step 1) We are going to start by drawing guidelines … all the guidelines are drawn in blue … this signifies that you should draw them lightly so that you can erase them later. (Step 2) Draw an oval and a line on top of the head as well as a letter ‘U’ shape for the ear. Draw an oval leg. (Step 3) Draw a sideways letter ‘L’ shape for the mouth and front foot. Draw 2 letter ‘J’ shapes for the tail. Draw the top half of a rectangle above the back foot. (Step 4) Draw another front foot…draw 2 curved lines for back foot. Draw an oval nose for the smaller dog…Max. (Step 5) Draw letter ‘D’ shaped eyes for the bigger dog, Duke. Draw letter ‘D’ shaped ears on Max. Draw a curved line for each of the legs. (Step 6) Draw a curved-ish letter ‘D’ shape for the nose. Draw two #7 shapes on Duke’s collar. Draw 2 circles for eyes … and an oval for the mouth. 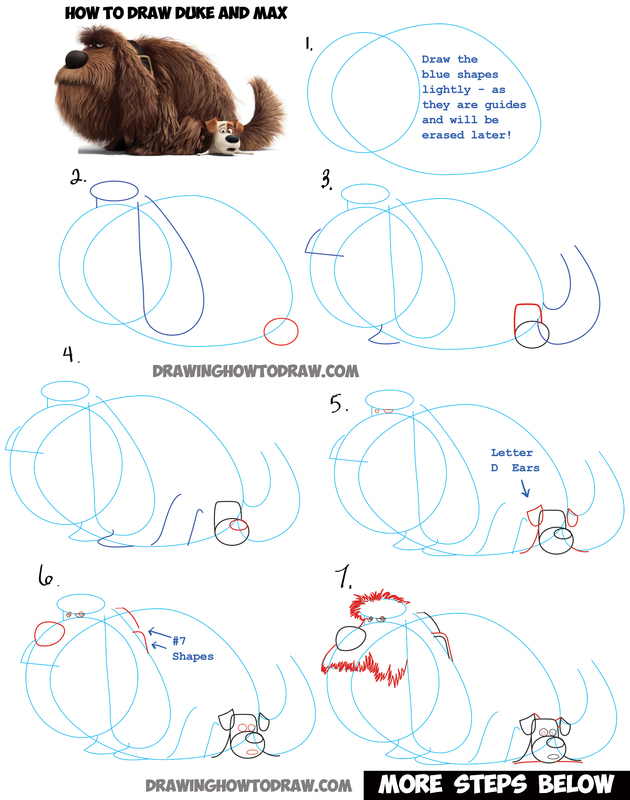 (Step 7) Draw zig-zaggy shapes for Duke’s fur…use the guidelines to help you place the fur. Draw another #7 shape on the collar. Draw a few lines on Max’s ears…also draw an oval in each eye. Draw lines for the bottom of his body. (Step 8) Draw zig-zaggy shapes on Duke’s fur. Draw eye brows on Max…as well as an oval in each eye again. Draw sideways, uppercase letter ‘D’ shapes for his feet. 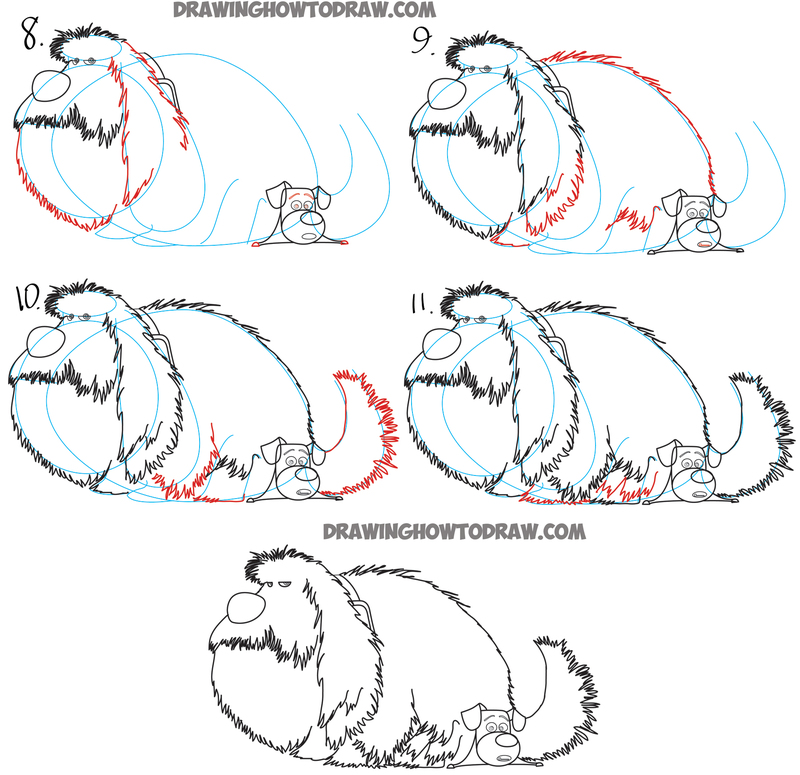 (Step 9) Draw zig-zaggy shapes all over Duke’s fur..using guidelines to help you again. Draw Max’s teeth. (Step 10) Draw zig-zaggy shapes all over the guidelines on Duke again. (Step 11) Draw zig-zaggy shapes for the finishing fur.